Andrew Robertson took on a 100 day weight-loss challenge on the advice of his UFIT Amoy St trainer Lawrence Cartwright. Over that time Robbo had to cut alcohol for 100 days, send Lawrence photos of every meal he ate, and make huge changes to his diet. Lawrence also suggested he go public on Facebook over those 100 days for extra motivation. The results? Robbo lost 15kg and 6% body fat. Even better, he changed his several-decade long drinking habit, found he could enjoy going to bars and restaurants drinking water and eating veggies, got his friends involved, and ended up supporting two great Aussie charities, Beyond Blue and Soldier On who support people with depression and anxiety. In Robbo's words: "With the giving up of the grog I went from replacing one excessive habit to working out six days a week and feeling so much better". What made you decide to take on a 100 day challenge? I've been complaining for years that I needed to get off the grog, usually on a Monday morning!! However it has been a constant refrain with my trainer Lawrence Cartwright with me stating I needed to give up and him saying well just do it. Long story short - one Tuesday morning session after a particularly long weekend I launched into my usual “I need to give the booze a rest for a while” when Lawrence just said look either do it or shut up complaining (or words to that effect). It was similar to being told off by my daughter and I’m pretty sure they had been scheming!!! Anyway something switched in my head and boldly I said right then I’m off the grog for 100 days. You could have heard a pin drop in the gym!!! Seriously did he say 100 days, no that cannot be right, Robbo a 100 days off the grog, well this will be interesting, buckle up sparky and hang on for the ride!!! The training has been far more intense, even though I'd always been fairly active (life’s motto 100mph or asleep) and trained hard (though Aaron and Lawrence suggest more like 60%). Interestingly it became the default activity for releasing stress and then it was a case of just pushing myself harder both at Amoy St and then at home when training. We switched to a more strength based program in the gym and then cardio was done at home, with Lawrence (amongst others) getting into my head about how far I could push this old body of mine. The neighbours have stuck their head over the fence and asked if I’m OK as I grunt and groan. We have told them if I’m too quiet then please worry. My diet for the first two weeks of the 100 days was non-existent. I hoovered just about everything in the fridge as I seemed to crave chocolate (Tim Tams what Tim Tams!!! ), bread etc. We figured that it was just the sugar cravings. After the first two weeks I got a little more serious and gave up processed bread, noodles and spuds (and my beloved chocolate). We figured it would be easier to gradually take things out. However in general up to the 50 day mark the diet was reasonable without going overboard. For the last 50 days we got really strict. No bread, pasta, noodles, potato – it was meat, veggies, fruit (berries mainly) and salad. To be honest some days I ate like I was 21 again with heaps of bacon, eggs, avo and tomatoes after training, other days if I didn't feel like eating I didn't. The longest fast was 3 days. Lots of whey shakes. The only thing we disagreed on was dairy intake. I maintained three serves of dairy every day, so either home made whey shakes or milk for breakfast or late dinner, and cheese. The deal was that if I started to plateau I would give up the dairy but I lost more in the second half of the challenge than I did on the first (and dare I say it Mum was right again, still she has been in the food industry for a while!!). There were cheats obviously, some ice cream here and there, a piece of cheesecake, a small brownie, a Bundy Ginger Beer watching the footy. However as I had to take a photo of everything I ate and send to Lawrence that created the discipline and also made me aware of what was on my plate. The interesting thing was my body's reaction to the ‘sugar’ foods and let’s just say the body punished me way more than Lawrence ever could think of!!! Since finishing the challenge I have tried to moderate my carb intake and to be fair it has been reasonably easy. Going out and asking for veggies instead of mash or chips is now second nature and I still haven’t had spuds. A meat pie down in Oz with my daughter was brilliant but I managed to stop at one, so maybe I am learning moderation. More importantly the same with the grog. I am learning that moderation is fine and can make the switch to my beloved Icelandic Sparkling water (my drink of choice for the challenge and now also for gin!!). How did you feel over the 100 days? The first three weeks were horrendous, not the training but the headaches. I would Google giving up alcohol cold turkey and it would say DON’T. It wasn’t this bad giving up the smokes. However eventually they went away and whilst every now and then would come back by midway I was feeling pretty good physically. By the end I was feeling physically great, sore but certainly in far better shape than I had for a couple of decades. I won’t say the sleep was significantly better as I was still tired and mentally it was a constant challenge to continue the same social life but ensure that I kept off the booze. However overall I’m feeling really good about what I achieved, the support of mates and the impact it’s had so not a bad result all round. Have the results met your expectations? I was gobsmacked at the end and I’m not usually short of a word!! 15 kgs dropped over the 100 days, about 5-6% body fat loss over the last 50 days, 3.5 inches gone around the waist (costing me a fortune in new clothes). More so than my personal achievements has been the impact it's had on others. This was always meant to be a personal challenge to give up the grog and see if I could modify my drinking habits (don’t mind to have a few yards over a few beers, wines etc). I had two mates that joined me one for 100 days and one for 50. Both finished. I trained on the weekends with mates and their kids who swung round, the support by mates and family has been enormous and goes a long way to getting you through this. It meant that I could turn up to an event or a pub an no-one batted an eyelid that I was drinking water. It was really positive. I have also found that going to the pub and not drinking is not boring. I’m still loud, cranky, love a yarn, smash water down the same way I drank beer and generally hate it when my footy team loses. You don’t need to be a hermit if you doing this as life is too short. Just find your drink of choice and not soft drink!!! How are you continuing with it - what’s next? As my other motto is ‘never waste a good start’ I’m maintaining the fitness regime and being far more conscious as to what I eat and drink. I’m still conscious that I don’t slip back into bad habits with the booze and we have devised some “rules” around that. Roughly I have picked a weight and if I go over that then I’m off the booze and strict with the diet until well back under. Two months a year (first half and second half) I will go dry and cannot drink on days that I don’t exercise hard. As with most things I went into this without any plan and just winged it. This is as close as I get to having some structure to my life!! I have got to say that Lawrence went way over what is expected of a personal trainer. It’s bad enough he has had to put up with my grunting, groaning, smart comments and expletives as I yell at myself and him (along with all the other long suffering clients and trainers at Amoy Street) but for this challenge he got sent pictures of all my food, me post workout, videos of me providing constructive but direct feedback as to what he could do with a new exercise challenge he had set me and I had just completed. So to be really honest I would not have got through this without his guidance and support. As with all things at UFIT it's a strong team and the support and encouragement from all of the trainers at Amoy Street has just been overwhelming. From having to put up with me whilst Lawrence was away, asking how I was going, personal WhatsApps providing support around diet, training, suggestions around taking photos weekly to see the impact and generally just putting asmile on my dial with some crack, it has just been a cracker. It would be unfair to single anyone out but Rachel and the team at Amoy St really provide for a great sanctuary from the daily grind. Anything more to add about Lawrence? Oh where to start ... Lawrence thought it would be a good idea if went public with the challenge. So I drafted a long piece on Facebook and decided that if I get through the 100 days I would donate $1K each to Beyond Blue and Soldier On. Both are charities that help people with depression and anxiety, this having personal resonance with me and my family. Well the Facebook thing kicked off and every day I would get up and post what day I had just finished. I thought people would get bored but the reactions were priceless as I introduced bingo calls, concerns about my welfare as the wallabies, waratahs and NSW Blues lost again and again. Lack of alcohol had not helped my loudness, coordination or eyesight and dropping a weight on my toe at training with Lawrence.....well you could have heard a pin drop at 7ish one morning! Lawrence told me that I should try to do a 5km row, 100 burpees and then run for 20 mins. 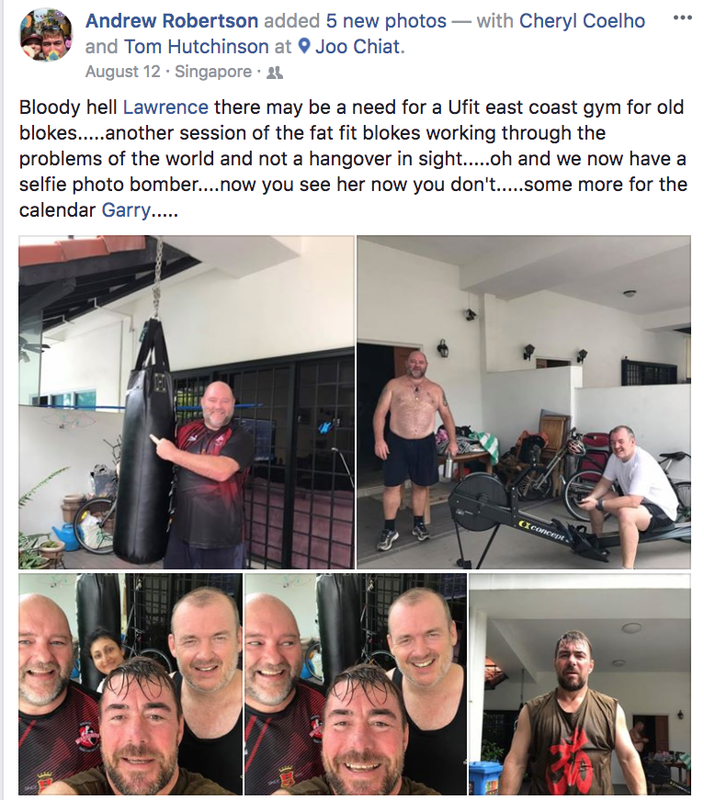 When I finally informed him I could only do 50 but had done the rest it transpired he had it got the program wrong and it should be 2km row, 100 burpees and no run….. that stretched the friendship and started a debate amongst Frazer, Will and Lawrence as to what my next exercise challenge should be. Word of warning if anyone asks you to combine rowing with a heavy bag, politely decline. I’ve been training Robbo for 3.5 years and he’s come a massive way in his fitness and his strength has gone through the roof. We've been up and down with his weight but it's come down a lot since the start. It started at over 100kg and it flew right down. For a while we weren't getting anywhere with his weight and I said to him mate let’s get more serious and come up with a bit of a challenge. He was always a drinker so we came up with 100 days of no drink. After 50 days to really make big changes I told him to send me a photo of every single meal he had, and I was like change this and change that, and I said right let’s go completely carb free. Over the last 50 days he went really strict and that's where you can see the massive change difference in his weight and body fat. His strength has stayed the same, and he's still strong, deadlifting two times his body weight for 5 reps of 160kg. The main reason he stuck to this challenge was putting it on his Facebook - so he went there and said right I’m gonna do 100 days no piss. He got a massive following and his friends were like no way mate, wow that’s really good. People were motivating him from day 1, day 2, all the way up to 100 and people were really following him. I really enjoy training Robbo, he's a character in the gym and he knows everyone here. You'll hear him yelling from all over the gym. He's really uplifting and a natural motivator also for the other clients around him. We really love having him here and are all really proud of him. How has he been sinced he finished the challenge? He's dropped another 1.5kg since finishing because he's been training so hard. We've re-introduced carbs which he needs to fuel him though his training which he does sometimes twice a day. Also his main focus has shifted - over the 100 days we wanted to drop weight and body fat, and we're now building on strength and muscle gains so have changed his diet and training somewhat. As well as training here at the gym three times a week he plays rugby with The Wanderers and he does a cardio ciruit at home to supplement his strength work here in the gym. Robbo supported the two Aussie charities Soldier On and Beyond Blue who support people with depression and anxiety, especially in men and young adults. He contributed $1.5k to each charity and a number of Robbo's friends matched that contribution. And there was the toenail money. Either way a great result and exposure for both of the charities and depression.